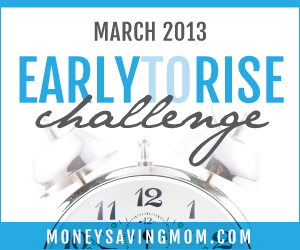 This is Day 23 of Money Saving Mom's Early to Rise Challenge. So, I didn't write my invite to Hubs yesterday. It was a bit of a stressful day and it just never happened. Hubs and I have had a hard time communicating too, so that's put a strain on us the past couple weeks. We were doing ok for a while, but last night it just kinda fell apart. I know every couple goes through times like this, but it doesn't make it any easier. It does help to know that we're not alone. I just wish we could fix it for good. I'll pursue this challenge again today after Hubs goes to work. Day 23 talks about writing. This is not something I love to do, or even something I feel I'm good at. I tend to write the way I think and speak. I have no idea whether or not this is even a good thing. A writing challenge is both a bit intimidating to me and a little uninteresting at the same time. My type A personality wants to do it because it's the next step in the challenge, and I do want to write for my blog. But it's also a bit uninteresting at the same time because I don't want to write a book, only my blog. Maybe I'll think on this a bit more. Never say never, I suppose. Our action tip for today is to write down ideas for a book. We also have a word count goal to start us out. Now since I've never been a writer or thought of myself as a writer, I can't say I'll pursue this part of the challenge immediately, but if God is leading me there, of course I will follow. 1. 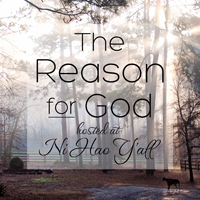 Continue to blog, possibly daily, about our family, adoption, daily events, just as a log of what happened in our daily lives. 3. Children's books - There are so many children's books out there, and while I know I don't have the ability to be a good illustrator, I do love the simplicity of telling a children's story. This could have potential. So, what time did I wake up? 5:22 am, and I have to confess I did hit the snooze button once. D-baby was freezing in his room, so I brought him into our room and warmed him up a bit. It was good to cuddle with him for a little while, and I think it was time well spent. What do you think about writing? Love it or hate it? Have you always wanted to or does it intimidate you like it does me?